Both distributors and customers know that the cardboard shipping container chosen for different shipments is sometimes as important as the product itself. It is imperative for a company that the item ordered arrives at its final destination in the same condition it was packed in. No consumer awaiting a produce shipment would appreciate receiving a soaking wet box instead of a stiff, sturdy, dry one. Introducing wax cardboard shipping containers – the effective way to ship temperature sensitive products. The package you are choosing to ship goods in can either make or break your company’s reputation and deeply impact your overall quality rating. Wax cardboard shipping containers are widely used to ship perishable items that need to remain fresh and inedible products that are expected to travel through harsh weather conditions. They are specifically designed to withstand cool room storage facilities and are ideal for shipping seafood, poultry, and produce (some can actually keep items frozen for long periods of time). These boxes usually have various holes along the top and side panels to allow for air ventilation. The type of wax used is an odorless, tasteless paraffin wax. The paraffin wax can produce a gloss and resist friction, moisture, odor, grease, and much more. The cardboard shipping containers themselves are made out of paper, which means they are lightweight, inexpensive, but unfortunately not very sturdy. The wax coat enhances the durability of the box and maintains the aroma of the shipped item. The paraffin wax can be applied to the cardboard shipping containers in one of two ways: spraying and curtain coating. Spraying the wax involves saturating the corrugated board to create a thick layer, while curtain coating involves passing a board through a “curtain” of falling wax to create an even, secure mask. A great added feature wax containers provide is their environmental impact. Cardboard is a plant-based product so waxed cardboard can find use as compost, or be recycled into items such as synthetic fire logs. Choosing to purchase cardboard shipping containers over plastic ones simultaneously provides your employees and customers with a user-friendly product while protecting our earth. All in all, waxed cardboard shipping containers require a small investment and deliver a large return. They are available in all shapes and sizes: corrugated containers or boxes, folding cartons, wrappers, bags, and pouches just to name a few. Wax containers are growing in popularity and are quickly becoming a favorite among the masses. Similar to standard containers, they can be printed with designs or writing and used as advertisement for your company. Whether you need to send a 200lb swordfish or a small box of clams, the wax cardboard shipping containers provide storage, protection, and promotion for your products and brand. Individuals choose cardboard shipping containers everyday as a method to ship both personal items and business products across the country. The two most common types of boxes are single wall and double wall. The wall refers to the number of corrugated boards each side is comprised of. Of course, double wall is much sturdier than single wall and can support up to 150 lbs more. Already more than a $17 billion industry, the demand for cardboard shipping containers is predicted to rise annually 2.4% through 2014. 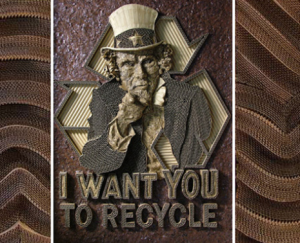 Since concern for the environment is an ever-growing issue, the need to recycle such products is essential. Over 90% of products in the U.S. are sent in cardboard shipping containers, 70% of which are recovered to either recycle or reuse. Fortunately, the boxes are produced without any wax or chemicals so they are an extremely easy material to salvage. These containers can be transformed into paperboards, clipboards, paper towels, or just simply reused for shipment of other items. 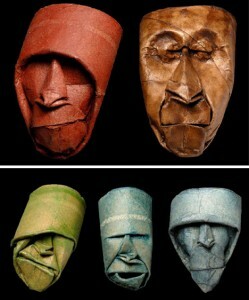 This paper artist paints the inner cardboard tubes from toilet paper and folds them into expressive faces, each distinct and charming despite their humble origins. Who doesn’t love art that breaks the mold? 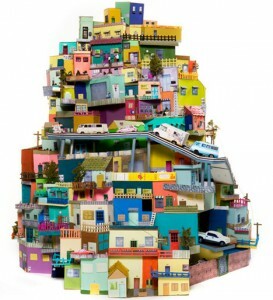 Many professional and aspiring artists have been turning these cardboard shipping containers into their own masterpieces. Cardboard is an effortless material to paint on and allows the artists to express themselves while providing real solutions for cost and eco-friendliness. From toilet paper rolls to industrial cardboard, everything is a potential canvas. You don’t have to be Pablo Picasso to create a work of art, and your materials have never been more accessible. Why not create a beautiful painting or 3-D animal while consciously helping promote eco-friendly activities? 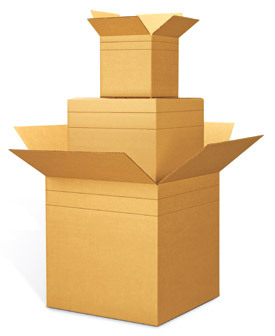 Here at TOTALPACK, Inc., we offer a variety of different shapes and sizes of cardboard shipping containers. Typically our products are used for shipping purposes but as you can see, there are no limits to the imagination! Our boxes have a high crush resistance and are extremely sturdy, ensuring your artwork will last for years. Whether you would like to try a new, innovative style of art or simply ship gifts and supplies to a friend, the uses for cardboard shipping containers are boundless! VISIT our store located under the “Shop” tab on our home page at www.TOTALPACK.com or call 1-866-760-7866 for numerous cardboard options.